Well, I did it again. I set my deadline for my dining room "wallpaper" project for tomorrow, not realizing that we are leaving today for a lake trip and will be gone until tomorrow evening. But a promise is a promise, so I am working frantically to get it done and will have it posted sometime tomorrow, along with a "Price My Space" type tour of the whole Dining Room. I will go ahead and show you part of the room that I am really excited about - this crystal lamp: I finally splurged and spent my birthday money to buy a pair of these lamps that I found on craigslist for $20 each. (The other one is in our Living Room.) They're real crystal and were originally $160 at JC Penney, and more importantly, they make me smile! Those are so pretty! I plan on buying some soon hopefully I am so inspired by your "wallpaper" mural, it's beautiful. You living room is coming together beautifully. The lamps are lovely ( $20.00 was a steal!) and I like the white apples too. So pretty! Your "wallpaper" is so beautiful. You are so talented! 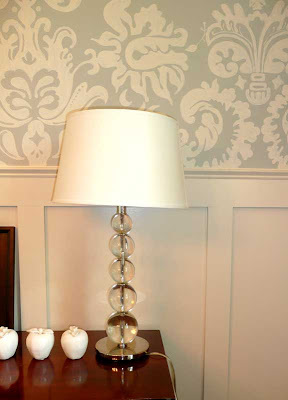 What beautiful lamps and a great deal! How nice of you to try and keep your promise - when I'm getting ready for a trip, packing soaks up all my brain cells, hehe, and nothing else gets finished! I'm looking forward to the reveal! I love the lamps! Can't wait to see the finished product. The painted wallpaper is GORGEOUS! And I love the crystal lamp! Your room is so inspirational! What a steal on those lamps!! Can't wait to see the whole room, hope you had a fun trip!